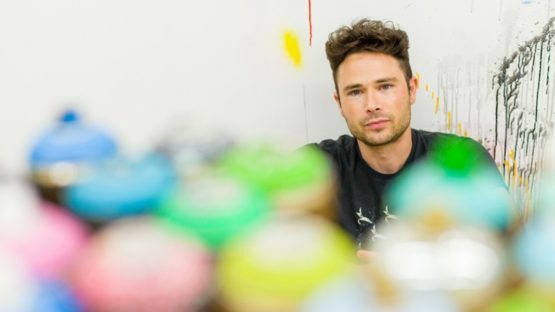 Alex Brewer aka HENSE is an American contemporary artist, best known for his dynamic, vivid and colorful abstract paintings and monumental wall pieces. Born in 1978, in Atlanta, Georgia, HENSE was raised in an artistic household, which allowed him to be surrounded with various influences since his early age. As a result, he showed an interest towards creativity early in his life, drawing and painting his favorite childhood heroes and characters. HENSE’s teenage age were marked with the discovery of graffiti. 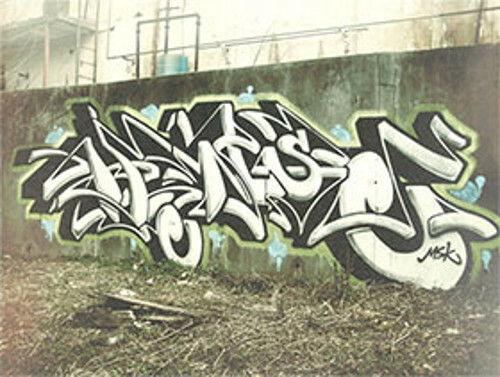 In the early 1990s, Brewer started his journey into a street art scene, painting his first public pieces, and slowly making a name for himself. Working under the name HENSE, the artist has quickly became consumed with the graffiti culture. Nevertheless, Brewer was a bit different from other graffiti artists at that time – it was a mixture of formal education and experience in professional studios that have provided HENSE a great reception at the start of his career. All of these factors have lead Brewer to establish his unique, whimsical, abstract-inspired style. INTERIOR/EXTERIOR was a title of multi-faceted exhibition of HENSE’s pieces, organized by the Wiregrass Museum of Art in 2014. As a sort of retrospective, the exhibition served as a platform to introduce audiences to the artist’s 20-years-long and successful career as an abstract painter. HENSE’s artworks featured in the exhibition included site-specific installation, paintings, wood-cut shapes and works on paper placed both inside and outside of the traditional museum space. INTERIOR/EXTERIOR illustrated HENSE’s combined experience in the street and studio, highlighting his visual dialogue of spontaneous mark-making and explorations of elements that are absent of representational references. 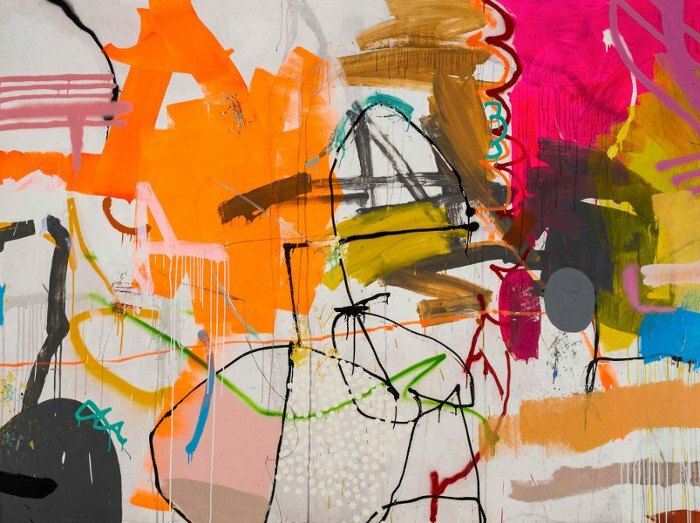 This dialog results in HENSE’s distinguished style depicted through elegant compositions saturated with bold lively colors and dynamic movement of fluid forms and gestures. In 2014, HENSE has been commissioned for another big public project, this time in Detroit, Michigan. 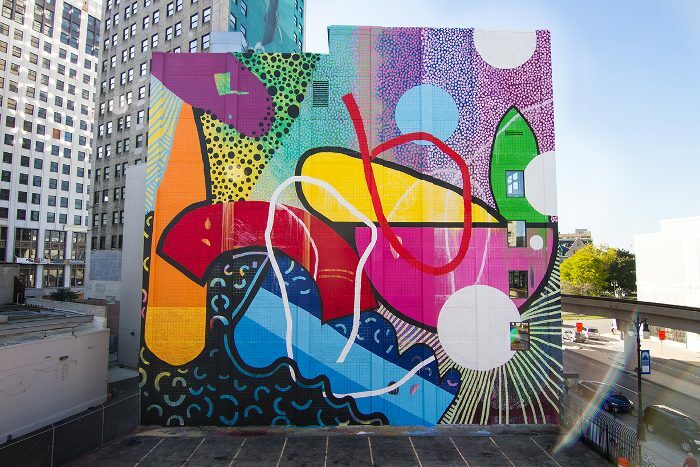 In a collaboration with Library Street Collective Gallery, HENSE has created a 6 stories tall massive-scale mural, painted on a 100×100 foot wall in the heart of downtown Detroit on the side of Bedrock Real Estates Madison Theater Building. It took HENSE and his several assistants almost 3 weeks of working and over 100 gallons of paint to finish the project. This large-scale mural differs from other HENSE’s work in a way that he selected colors ahead of time and had a little bit of an idea of what direction he wanted to go in. Usually, his works emerge from a spontaneous process, from a bundle of ideas regarding solely non-figurative elements of form, line, color, and composition. Apart from the above mentioned commissions, HENSE’s oeuvre includes many more projects, public commissioned work and installations that have led him across the globe. One of the countries in which HENSE has left his mark is Australia, besides others. 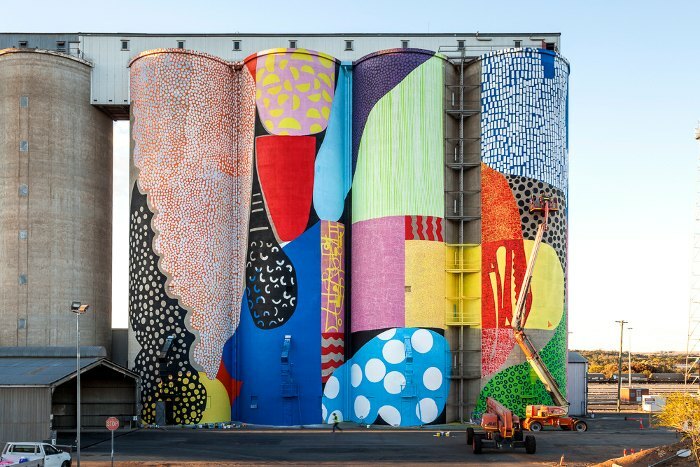 In 2015, the CBH Group commissioned HENSE to paint several grain silos in Northam, Western Australia, his second largest installation to date. The large-scale artwork, spray-painted on the concrete silos was organized and funded by FORM for PUBLIC 2015. Other projects include the one made for The ISIL Institute in Lima, Peru, for which the artist painted an impressive-sized wall, 137 feet tall and 170 feet wide. In Washington D.C, HENSE painted the entire facade of a former church in his characteristic, colorful style. One of Brewer’s highest honors was a commission by The High Museum of Art in Atlanta to produce a site-specific installation as part of the museum’s summer exhibition Drawing Inside the Perimeter. HENSE lives and works in Atlanta, US.